e BR-V is Honda’s new India-bound small SUV and a model that will take on the Hyundai Creta,Renault Duster, Nissan Terrano and Maruti S-Cross when it goes on sale in early 2016. It’s built on the same platform as the Brio, Amaze and Mobilio but you won’t see the semblance at first glance. The BR-V has a more upright stance and a completely different front end that actually looks quite interesting for its squared-out bonnet, angular headlamps and chrome-rich two-part grille. The bumper is unique too and features a scuff plate low down to lend the BR-V that SUV look. Roof rails, and plastic cladding on the lower portion of the bumpers, wheel arches and doors are some other SUV-typical details you’ll find on the BR-V. Stylish 16-inch rims further add glamour to the Honda, although you’ll agree they do look a size small given the SUV’s large body. While final spec for India hasn’t been decided, it seem unlikely the BR-V headed our way will get larger wheels. See the BR-V in profile and you’ll rightly think of it as the largest of the small SUVs. Its 4,456mm length makes it significantly longer than the 4,270mm long Creta for instance. The 2,660mm wheelbase is also best-in-class but a lot of the overall length also comes from the long rear overhang. 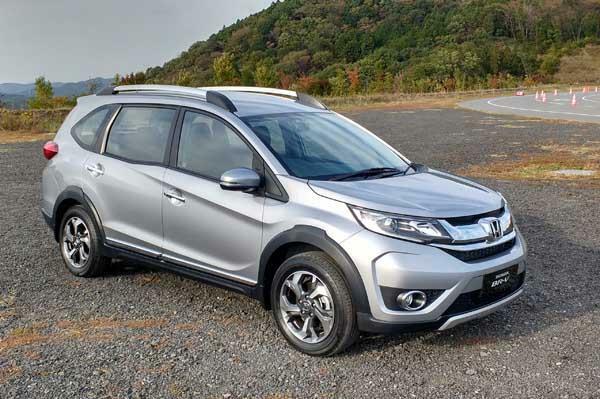 The advantage is that this has allowed Honda to fit in a third row of seats, something which will make the BR-V the only seven-seater in its segment. On the flip side, the extended rear gives the BR-V a somewhat MPV-like look from the side. That the rear doors seem straight from a Mobilio only strengthen this impression. The kinked rear window and relatively large rear quarter glass are neatly executed though. As for styling at the tail, it's attractive if a touch on the flamboyant side. Things like the solid chrome shroud for the number plate mount or the reflector that runs the width of the tail to link the smart tail-lamps seem overdone to our eyes. In fact, the tail scores for practical reasons rather than for pure aesthetics; the large rear windscreen offers good visibility and the tail gate extends low down which makes loading and unloading luggage easy. 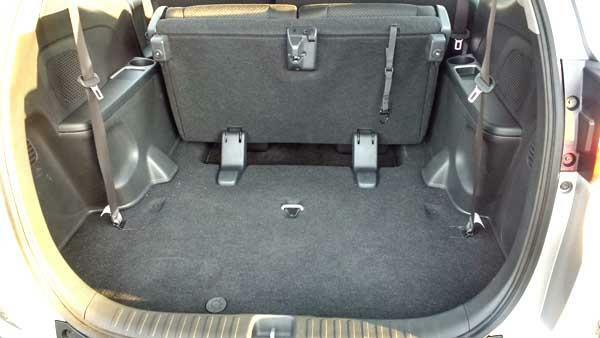 What’s also nice is that even with all seats up, there’s a decent amount of luggage room in the BR-V. The rearmost seat can also be folded forward to make more space. 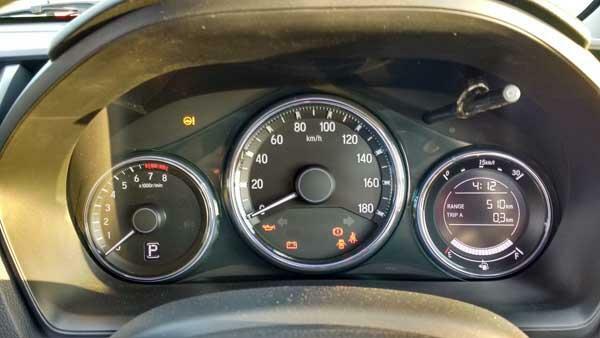 The BR-V may have lots of parts common with the Brio, Amaze and Mobilio, but thankfully the dashboard isn’t one of them. In place of the plain and frankly Spartan dash found in the aforementioned trio, the BR-V’s dashboard comes from the Jazz. Therefore, the whole cabin looks a lot more premium. 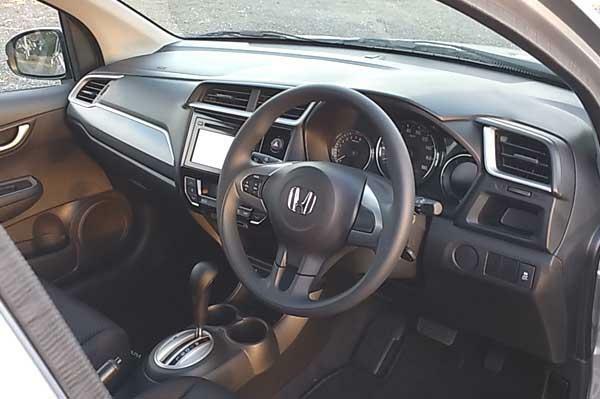 Also, the cabin of the BR-V prototype we had with us also boasted superior quality levels than what we’ve seen on Indian Hondas of late. There’s a nice mix of textures on the dash and the general finish is noticeably better, though it’s still not quite at Hyundai Creta benchmark levels. Either way, the feel from behind the wheel is that of sitting in a jacked-up Jazz. The seating position isn’t all that high but visibility is still good; the high dash top might not be to everyone’s liking. 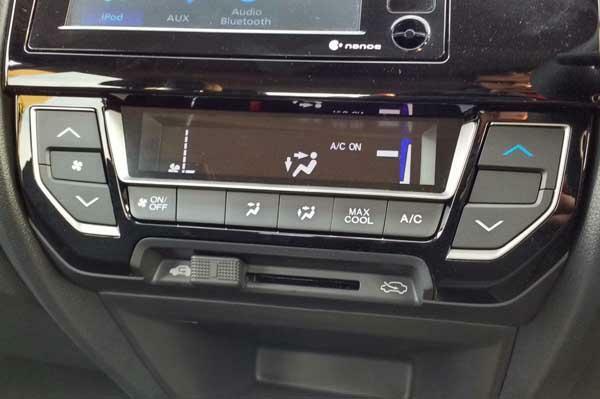 Again, Honda hasn’t revealed final specs just as yet but it’s safe to assume the BR-V will come with a touchscreen infotainment system as the one on our test car. Interestingly, the prototype featured a conventional arrangement for the climate control system rather than the futuristic but distracting touch panel from the City and Jazz. A roof-mounted air-con for the second row is something you can expect too. Comfort-wise, the BR-V scores well. The slim front seats feel well cushioned and the middle-row seats with their adjustable backrests are quite nice as well, somewhat lack of thigh support notwithstanding. Middle row legroom is good (the seats can be moved back to create more space) and headroom is aplenty, but the BR-V’s cabin isn’t wide enough to seat three abreast in comfort. And that’s when the last row comes handy. Access to the back is decent and space is not bad either; the large windows help this section of the cabin feel reasonably airy too. However, the knees-up seating position means even those who will fit here won’t be happy for too long. The BR-V sits higher up than the Mobilio MPV and ground clearance is at an impressive 201mm. To compensate for the higher centre of gravity, Honda has widened the BR-V’s front and rear tracks by 25mm each. Honda has also made changes to the suspension. The lower arm of the front suspension has been altered to take on additional loads while there’s a thicker torsion beam at the rear for better stability. The brake discs at the front are updated and now measure 15 inches; the rear still uses drum brakes. 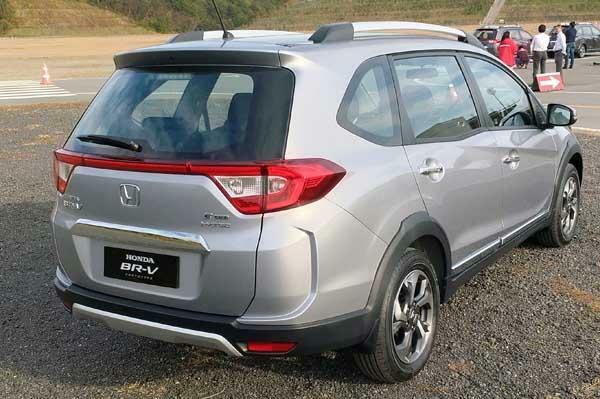 Our drive in the BR-V wasn't very long and was conducted on a Honda test track, but first impressions from behind the wheel suggest that Honda has done an extremely good job. Straightline stability is extremely good to begin with. Yes, the long wheelbase does help and so does the fact that the suspension and chassis have been stiffened, but you are so relaxed behind the wheel, it really is quite impressive. What adds to this feeling of confidence is that the steering system is very direct and has very little slack or play. It has a nice weight to it and this allows you to place the BR-V quite accurately on the road. You do feel the length of the car, especially in tighter corners, and the BR-V does roll a bit too, but get behind the wheel and the car masks its length so well, it is difficult to believe this car is built around the same basic platform as the Brio. What also helps give you confidence are the bigger brakes. Stopping power is really good and the bite point on the brakes is so well defined, you can just hit them, knowing full well that the BR-V will come to a quick halt, exactly as planned. Judging the ride however proved to be almost impossible. Honda's test track inside its Motegi Circuit Complex is as smooth as a baby's bottom, so the suspension didn't really get a work out. The BR-V will come to India powered by a pair of engines we are familiar with. Both the diesel and petrol units displace 1500cc and can be found in cars like the City and the Mobilio. The petrol makes a near identical 119bhp, and Honda says it is working to improve the performance of the 100bhp diesel. There's unlikely to be a significant increase in power, but the manner in which power is made is likely to be more user-friendly. Honda could specify both cars with a six-speed manual gearbox. The petrol prototype we drove, however, came powered by Honda's 119bhp 1.5 i-VTec engine, mated to a CVT automatic. Now Honda's CVTs always seem to impress. They come equipped with a slender torque convertor and this allows them to take off smartly from rest. The BR-V feels even more energetic. Honda says it has shortened the gearing of the CVT to make it more suitable for this heavier car, and as a result it seems to take off with an extra dash of enthusiasm. Initial response in fact is so good you don't seem to encounter the stretch and strain of the CVT 'box until you have crossed 3,500rpm on the tachometer. And this is great if all you want to do is drive at regular speed. Of course push the accelerator pedal down hard and you will encounter the 'unholy' rubberband effect, where the revs of the engine seem to rise without any corresponding increase in speed, but all in all, the petrol and CVT 'box work so well together, you only miss the performance occasionally. When Honda launches the BR-V sometime in March or April next year, it will definitely be an SUV or crossover to would want to add to your shortlist. Big on size and space and blessed with an all new dash, the BR-V is likely to appeal to a whole swarm of would-be value-driven customers. Likely to be priced somewhere between the EcoSport and Duster, the BR-V promises to appeal to customers on both sides of divide. Yes, it could have been a bit nicer-looking, the cabin should have been a bit more upmarket and some additional power would have worked wonders too, but even as things stand, the BR-V seems to have plenty to offer. Honda's baby CR-V just could be the one that gives you the combination of value for money and ability you are looking for.